This Viking Sax is a broad-bladed knife, although given its length this wood-handled blade is practically a Viking short sword. This impressive Viking knife features a long, broad blade that is ideally suited for cutting and carving. The blade features a small fuller along the knife's spine, which helps to lighten the knife's weight without decreasing its strength. The blade features a flattened, clipped point that is still quite effective at stabbing and thrusting. The handle is made entirely from hardwood and features a full-tang design for increased strength. The blade is made from carbon steel and is left unsharpened. Included with the sax knife is a leather belt sheath. 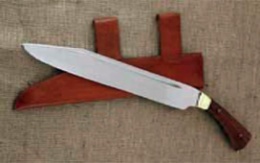 This knife has an overall length of 24 inches. While it might have originally been a utility knife, this Viking Sax is definitely not limited to that role thanks to its impressive blade. The Viking Sax/ Seax or o-called broken-back style seax, was usually a bit heavier than the regular knife and would serve as a machete- or falchion-like arm. The Seax was in widespread use among the Migration period (4th century AD-8th century AD)Germanic tribes, and is even eponymous of the Saxons. It appears in Scandinavia from the 4th century, and shows a pattern of distribution from the lower Elbe (Elbe Germans) to Anglo-Saxon England. While their popularity on the continent declines with the end of the Migration period, though they remained in the British Isles where it was taken up by the Vikings. This page was last modified on 29 September 2013, at 18:12.